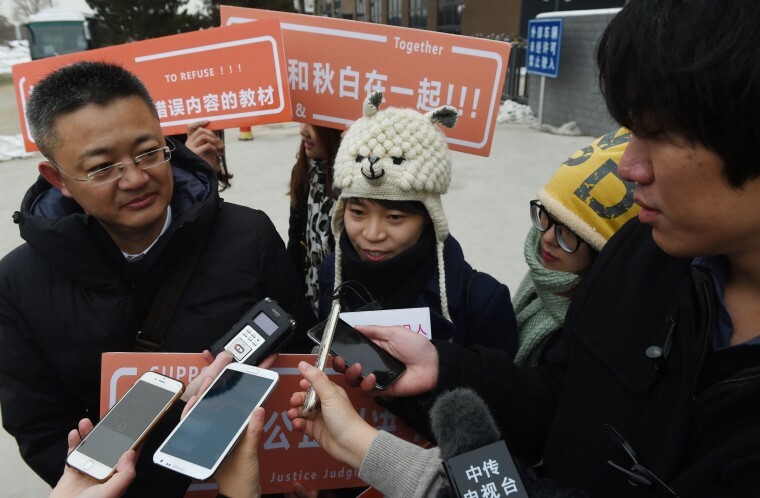 BEIJING – A court heard opening arguments Tuesday in a case calling for textbooks published by China's Ministry of Education to alter or remove sections calling homosexuality a disease that can be cured. A student who goes by the pseudonym Qiu Bai discovered the issue two years ago when as a curious freshman she looked through medical textbooks seeking answers about her own sexual orientation. The 20-year-old showed NBC News one of the textbooks — "University Students Mental Health" — which states that gay people can change their sexual orientation through therapy. The Chinese Psychiatric Association removed homosexuality from its list of mental disorders in 2001. But a 2014 survey conducted by China’s Tong Cheng Gay and Lesbian Campus Association found that 40 percent of textbooks published in the country after 2001 still classified homosexuality as a psychological disorder. Qiu Bai earlier this year wrote an open letter to the Ministry of Education pointing out the errors and requesting corrections. When she got no response, she filed the lawsuit in August. The No. 1 Municipal Intermediate People’s Court in Beijing heard the case on Tuesday and decided to hold a second hearing. “I want related departments to admit these errors and I want to have an equal and open discussion with them about these errors,” Qiu Bai said. “This case is not even close to ending. Unless the Ministry of Education take some real actions to change this, I won’t give it up."